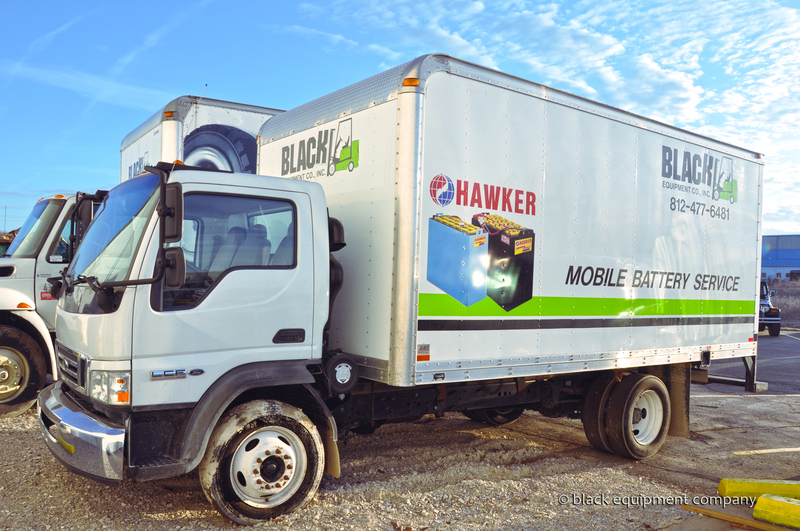 Black Equipment provides complete battery and charger repair service at your location or one of our 5 service locations. We have enhanced our ability to repair batteries and chargers on-site faster than ever. In addition to full battery and charger service, Black Equipment can wash batteries on-site in our mobile stainless steel wash station allowing all fluids to be safely removed and disposed off customer site. The filter and recycle system can clean and neutralize the waste water, making it environmentally safe before we leave your facility. Click here for Battery Care rules for Lead Acid Batteries. 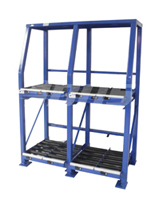 As a dealer for BHS, we offer the most comprehensive line of battery handling equipment to lift, move, and handle industrial forklift batteries and a growing line of warehouse equipment products. 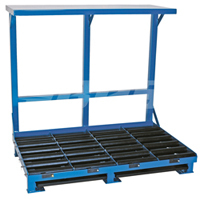 BHS products maximize warehouse space and improve overall efficiency. 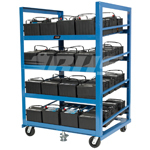 Download BHS Battery Handling & Warehouse Equipment Product Catalog Here. When choosing forklift battery handling equipment, first consider: the size of the forklift and battery fleet, and method of battery removal (side/lateral, overhead/vertical, or both). 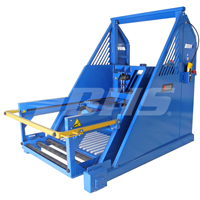 The BHS Automatic Transfer Carriage (ATC) converts a pallet truck into a portable battery changer and is available with hook/chain, vacuum, or magnet extraction. 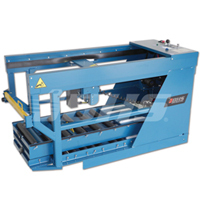 Shown with magnet extraction, optional Drop In Roller and bed extension. 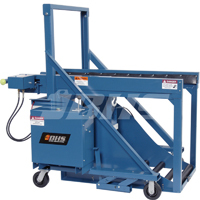 The BHS Mobile Battery Extractor (MBE) has a built in powerhead, 42″ battery compartment and is available with vacuum or magnet extraction. Shown with magnet extraction. The BHS Battery Transfer Carriage (BTC) manually transports batteries utilizing push/pull mechanics. The BTC is available in several models with extraction and lift/lower functions ranging from fully manual to fully powered. BTC-MPPAE shown with electric lift/lower function and electric, hook/chain extraction. The BHS Operator Aboard Battery Extractor (BE) is equipped with hydraulic lift/lower function and is available in hydraulic or electric drive. The BE is also available in single-level or multi-level up to four-high, has two battery compartments offered in multiple sizes, and can be outfitted with either magnet or vacuum extraction. BHS Double-Stack Battery Extractor (BE-DS) shown with vacuum extraction and BHS Double Stack Battery Systems Stands (BS-DS). The BHS Portable Gantry Crane (PGC) is available in powered and non-powered drive, 2- or 3-Ton models, and can be customized for capacity, height, and beam spans. 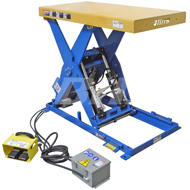 Shown with BHS Battery Lifting Beam (BLB), Hardwood Battery Stands (HBS), and BHS Hardwood Wash Station (HWS). 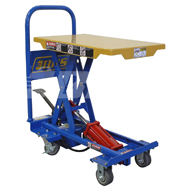 The BHS Multi-Tiered Battery Stands are equipped with poly-sleeved rollers, battery flip stops, and drip pan compartments and is available in a range of models. Double Stack Battery System Stand (BS-DS) shown with poly lead rollers in each battery compartment. 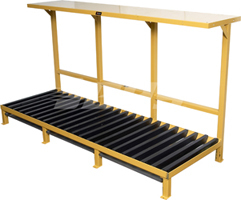 The BHS Hardwood Battery Stand (HBS) is equipped with plastic decking and charger shelf and is available in a range of models. Complete the battery charging room with hydrogen gas ventilation, electrical distribution, cable management, battery spill safety, eye wash, and much more! Contact us for a Battery Room Survey today! 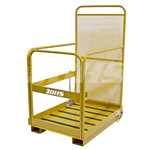 When choosing warehouse equipment, it is important to consider ergonomics, safety, comfort, and efficiency. 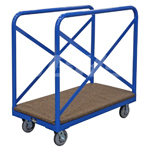 BHS warehouse solutions provide all of these benefits without sacraficing design and integrity. 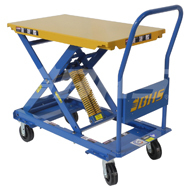 BHS Lift Tables provide an ergonomic value to most work stations and processes. 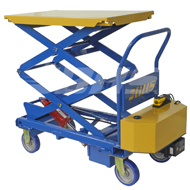 Models are available as stationary or mobile and manual or powered and can be customized to accommodate any operation. 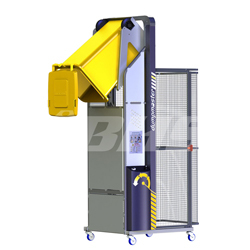 BHS Bin Tippers are the perfect solution for lifting and tipping waste, and can also be used to mix ingredients in food or chemical production. 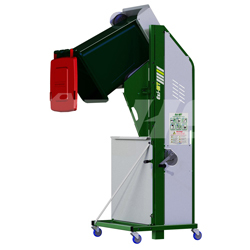 Models range from fully manual to fully powered and handle most typical bin or can sizes. 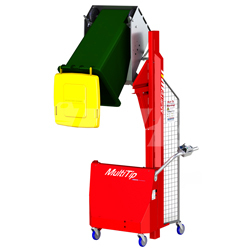 Bin Tippers can be customized to accommodate any application. 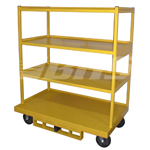 BHS Warehouse Equipment also includes products for storage, shipping and receiving, retail display, order picking, inventory management, material transport, and electrical product management. Call us now for more details!